Rhododendron ‘Madame Masson’ is a classic rhododendron cultivar from France dating back to 1849. It has been popular ever since, for a number of reasons. 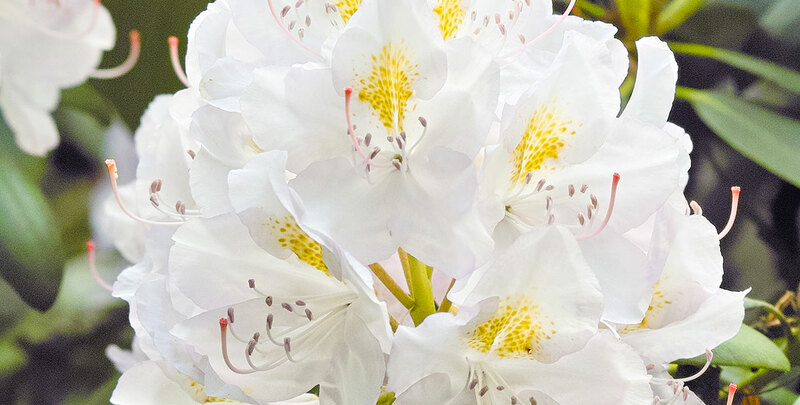 ‘Madame Masson’ is a very tough and reliable evergreen with striking star-shaped flowers with yellow markings that are quite unusual for a rhododendron. The flowers make their appearance in May and remain until the end of June. The shiny dark leaves provide a lovely backdrop for the showy funnel-shaped flowers, while this evergreen shrub as a whole can provide a backdrop for other plants if planted towards the back of a border. A typical rhododendron, it requires highly organic (humus-rich), lime-free acidic soil that drains well and plenty of water during dry periods. Waterlogged soils can be overcome by establishing a raised bed to improve drainage. Other requirements are a position in part shade, protection from strong wind and cold, deadheading after the flowers have faded, shallow planting depth and plenty of room to grow. Any necessary pruning can be done after the flowers have faded. Rhododendron ‘Madame Masson’ is exceptional in tolerating considerable sun, whereas most rhododendrons are sensitive to strong sun. Compact, dense and easy to grow in most situations, rhododendron ‘Madame Masson’ makes a useful hedging plant. It can grow to 2 or 3m tall at up to 20cm a year.